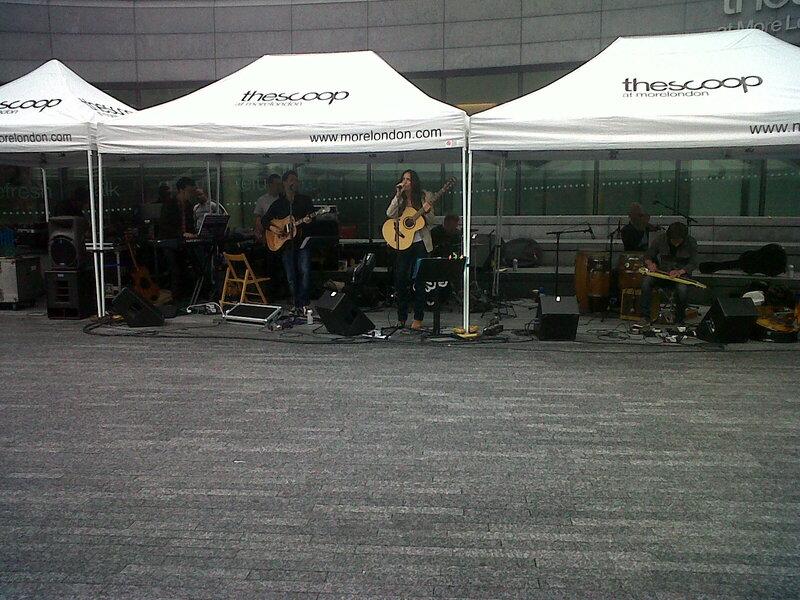 Scoop Festival - Mim Grey! 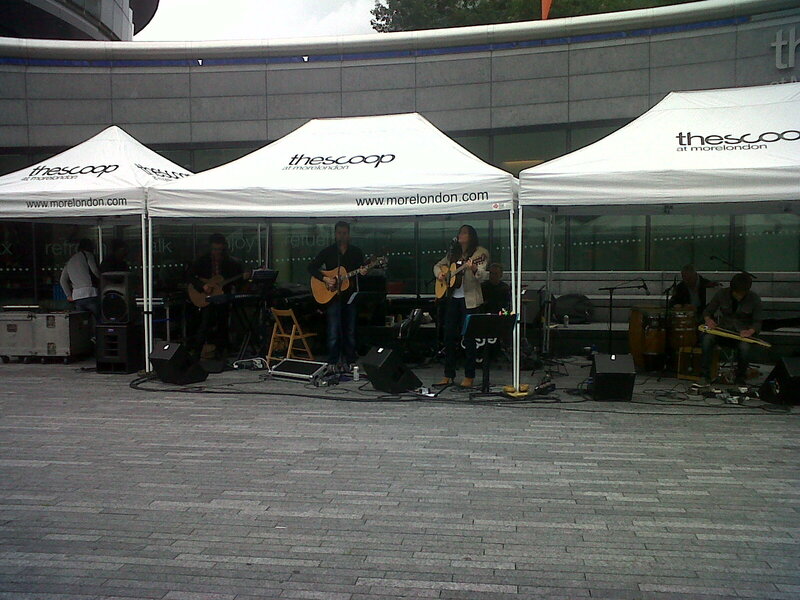 The Scoop at More London is an annual set of free music, theatre and film shows throughout July to September. The venue itself is an outdoor amphitheatre where there are steps to sit on and then awnings set up when needed for the performers. It backs on to the River Thames and is situated close to both London Bridge and the London Dungeons. It was here that Mim Grey returned on Wednesday this week. Mim had played at the same venue in July of last year to rave reviews and looked to continue that. 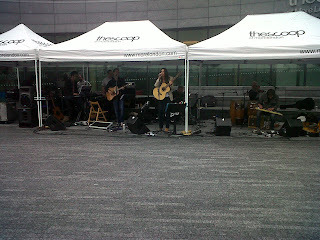 The fact that the performance was free and outside was in my opinion a brilliant thing for Mim. There were only a few clusters of people scattered around the venue when Mim started but when passers-by began to hear the music, you could see that more and more people drifted in, meaning that Mim's name and music was spread in a very clever way. 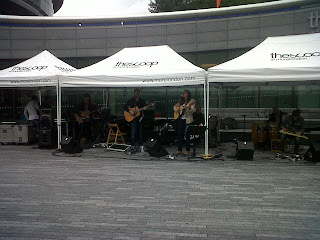 There was also a good atmosphere amongst the audience as they filtered in and they were all looking forward to the gig. The major problem was however, as it often seems to be in England, the rain. 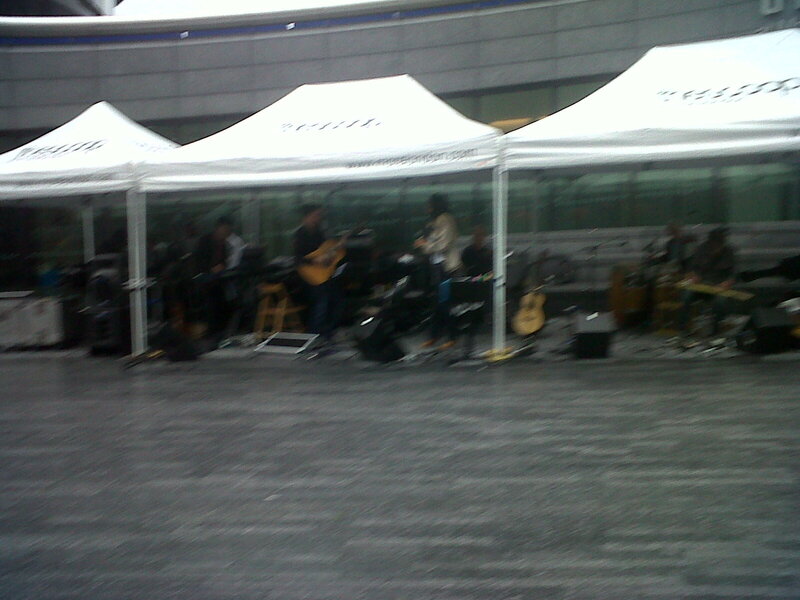 With the festival being outside there was no cover for the audience from the rain. Many listeners had however brought umbrellas or rain macs along and were content to sit and listen to the music in the rain, showing that there are some very hardy people out there! It was only when the amps and sound decks started to get wet though that the concert had to unfortunately come to an end. Luckily, Mim did get the chance to sing some songs and that was certainly enough to give newcomers to her music a taste of what to expect and to leave people who already knew her music happily singing along. She unfortunately didn't get the chance to showcase any of her newer songs but she did delight the crowd with some of her songs from her debut album "Grey Matters". She opened the gig with the lead song of the album, "Purple Sky", a song which glorious instrumental intro and smooth melody lends itself perfectly to opening a gig. A lot of Mim's songs focus on the lyrics with simple melodies rather than needing over-produced backing tracks behind them and it seemed like the perfect venue for this. Mim's voice blended well with the tones of her backing vocalist, singer-songwriter in his own right, James Deane and the rest of the band worked well in supporting her vocals while making every song seem effortless and perfectly performed. Even though by this time it was coming towards the end of the gig, perhaps the best song of the evening was "Sunday Best". The song has been a big hit for Mim in the past and has been played regularly on Radio 2. It's upbeat melody and catchy lyrics bring the listener along for the ride and once you've heard it a few times you can't help but sing along. Mim also showcases her wonderful harmonica playing on this track which makes it different from the other songs on "Grey Matters". I had another chance to speak to Mim after the gig and found out that she has a busy time planned for the rest of the year. Mim and her songwriting partner Cori Josias have just finished writing her second album and she goes into the studio later on this year to record it with a hopeful early winter 2011 release date. No word yet on what the album will be called but if any of the music that Mim has been playing at her gigs which isn't attached to "Grey Matters" makes the cut for the second album I am convinced it will be another brilliant one. I am also told that there is going to be a short UK tour to support the album so I would encourage everyone to keep an eye out for tour dates. I am a definite fan of Mim's and I am sure she will continue to grow both as a musician and as a writer. I urge everyone who hasn't already listened to her music to go out and buy a copy of "Grey Matters". Five star gig from me, both for the enjoyment of it aswell as the music.